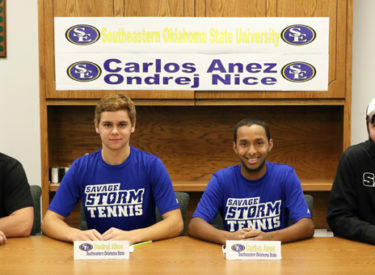 After winning Seward County’s second ITA National Championship this fall together, Saints tennis stars Carlos Anez and Ondrej Nice decided they might like a couple more years of playing together on the hard court as the two signed Wednesday in the All-American Room to continue their playing careers at Southeastern Oklahoma State next season. Anez was the Saints top player a season ago, winning Region VI Championships at both #1 singles and #2 doubles. He finished the year 16-7 in singles, playing all season at the top spot in the Seward lineup, tying him for second most wins in a single season in school history. In doubles action, he was 19-3 as a freshman last season, again tying for the second most doubles wins in a single season in program history. After winning the ITA National Championship this fall in doubles, Anez and Nice will begin the season ranked #1 in the ITA National Rankings. Individually, Anez checks in at #5 in the singles rankings following a fall season that saw him go 13-5 as the Saints top man. Nice had nearly identical numbers to Anez last season while bouncing across four different spots in the Seward lineup. He ended his rookie campaign 16-7 in singles, tied with Anez for the second most wins in a single season in school history, while claiming a Region VI Championship at #3 singles. Like Anez, Nice also captured 19 wins in doubles action as a freshman, seeing action at both #1 and #2. This fall, along with winning the ITA National Championship and a round in the ‘Super Bowl’ with Anez, Nice also picked up six singles victories for the Saints. He and Anez will open the year #1 in the ITA doubles rankings while individually he cracks the singles list at #11. After completing their sophomore seasons with the Saints in 2017, Anez and Nice will join a Southeastern Oklahoma State squad that it regularly ranked in the ITA Top 20 for NCAA Division II. Last season the Savage Storm finished 16-3 while advancing to the NCAA Division II National Championship Tournament.